Researchers plan to replace the tobacco mosaic virus nucleic acid, in blue, with non-infectious sequences of Ebola Virus nucleic acid. 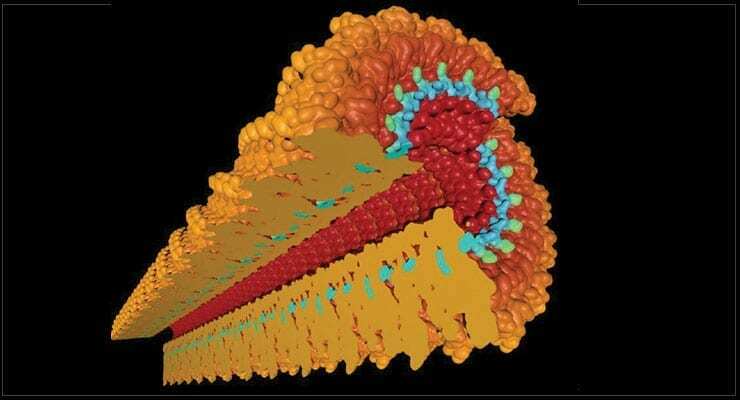 The protective protein coat, in orange, encapsulates and protects the nucleic acid cargo. Health care workers must diagnose and isolate Ebola victims at an early stage to have a chance to save them and prevent the virus from spreading. But the most sensitive and quickest diagnostic test produces a small percentage of false negative results that undermine efforts to control the deadly agent. Case Western Reserve University (CWRU) researchers have been awarded a $100,000 National Science Foundation (NSF) Ebola rapid response grant to develop a method to reduce the risk of the virus going undetected. “While Ebola is declining in West Africa, there remains a strong risk of outbreaks in the future,” said Nicole Steinmetz, an assistant professor of biomedical engineering at Case Western Reserve University. Steinmetz, the principal investigator of the grant and an appointee of the university’s School of Medicine, is not an expert in human viruses, but has extensive experience in manipulating nanoparticle-sized plant viruses for the benefit of human health. The test is designed to detect the presence of Ebola ribonucleic acid, RNA, a key component of the virus’ molecular biology. To extract the viral RNA from the tissue for testing, health care workers have to process the tissues, and the target RNA may be destroyed during the harsh conditions of the assay. These processing errors may remain undetected, resulting in a false negative result. Steinmetz’s lab plans to build a positive control through a bio-inspired nanomanufacturing protocol. The team will make a synthetic, safe form of the Ebola RNA and insert it in a plant virus nanoparticle. The plant virus has a protective protein coat similar to the Ebola virus coat that protects its RNA. This control will mimic Ebola virus realistically and can be added to test samples for detection and monitoring of the processing steps. “It tells us a mistake was made and the assay needs to be repeated to rule out a false negative result,” she said. Otherwise, the test could fail to detect the Ebola virus. Therefore, the patient might not be quarantined and treated, and those with whom the patient had close contact would not be tested. Working with Steinmetz will be Ruth Keri, a professor of pharmacology at the School of Medicine, and the University of Stuttgart’s Christina Wege.